In my sixteen years of married life, I’ve inhabited twelve different kitchens. I’ve occasionally had more than enough storage space, but more typically, I’ve not had nearly enough counter top area, shelving, and drawer space for my needs. “Need,” of course, being an operatively subjective word. One of my favorite cookbooks, Home Cooking by Laurie Colwin, has a charming little essay called The Low Tech Person’s Batterie de Cuisine. But as much as I enjoy reading about Laurie’s minimalist ways, I really cannot share them. (Perhaps it is because Laurie’s kitchens were all in New York City, while mine have largely been in Texas?) Unlike Laurie, I have great admiration for the garlic press – and I wouldn’t dream of giving up my massive food processor for a knuckle-shredding grater. I share Laurie’s fondness for wooden spoons and mixing bowls, but I really do not think they substitute for a mixer; nor do I think that a hand-held mixer substitutes for a standing Kitchen-Aid. (Mind you, a hand-held mixer is useful for making seven-minute frosting over the double-boiler; it’s probably best to have both.) Even minimalists will admit that there are “special interests that must be catered to.” Laurie requires a chicken fryer in her kitchen; I make do without one. However, the space that I have saved by not having a chicken fryer has been more than filled by the many, many specialist baking tins that I require. Mini muffin pans. Extra-large tart cases. Loaf tins of every size. A Madeleine tin. A cake pan in the shape of a present. My current kitchen, which is the old-fashioned galley style, falls much closer to the “not nearly enough storage space” side of the spectrum. When we last moved, from Houston to England, the packers forgot to pack the shelves under the island – where I kept many items of “occasional” use. I can’t remember the exact contents now, but items like the heart-shaped Belgian waffle machine and the large steel fondue set were housed down there. I wonder if there was some larger intelligence at work, and not just negligence, because we would have never fit all of the stuff in this much smaller kitchen. As it is, I’m using half of the pantry for my baking equipment, every shelf is precariously balanced, and my Le Creuset has to jostle alongside the breakfast cereal. In the past year, and despite space restrictions, I’ve acquired a cast iron skillet, a food mill and a stackable steamer. When my mother gives the girls that special “edge” pan for banana bread something really will have to go. Truly, my shelves are at breaking point; a few of the doors won’t even close completely. Despite my fondness for kitchen stuff, I will happily admit that some pieces of equipment earn their keep – while others are dodgier lodgers. 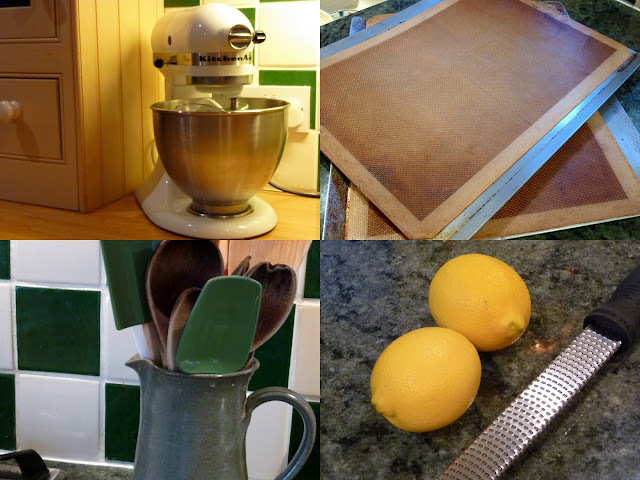 Leaving aside saucepans and frying pans, I’ve nominated four hard-working stars of my kitchen. I couldn’t be without them; if you don’t have them, I would encourage you to add them to your Christmas list. The KitchenAid Mixer. When I went to college, my mother gave me her old KitchenAid --- which had already done at least a decade of hard labor in her kitchen. I used it, continuously, for another decade . . . only passing it on to a friend when my mother bought me a new one. This is my favorite piece of machinery, hands-down. Worth every penny and deserving its space on my (limited) countertop. Cookie sheets and baking liners. I have made hundreds of cookies and biscuits on these. Tonight, I made homemade pizza on them. When it comes to baking equipment, good quality will really make a difference. Silpat (silicone) liners are one of the great inventions of the 20th century as far as I’m concerned. Microplane. (another gift from my mother) These are brilliant for zesting lemons and grating parmesan cheese. The very best tool for the job. Since I use those two ingredients to add flavor to all sorts of dishes, I use my Microplane nearly every day. Of course, this kind of list begs the question: What kitchen equipment do you value the most? My husband, who does not cook, requires three pieces of equipment: a microwave, a toaster and an espresso machine. (It is not a coincidence that all of these are machines.) Ironically, if given the chance, I would do away with all of them. If it was up to me, only the electric kettle and my beloved KitchenAid would be taking up space on my countertops. But life in the kitchen, as in life in general, requires compromises. For instance, I would like to have an island. I would like to have an Aga. I would especially like to have a big red Smeg refrigerator like the one in Julochka’s kitchen. Sadly, I will not be getting any of these things. Instead, I have a tiny refrigerator which is hidden behind a door front. Although I’ve made room for the over-sized spaghetti pot in this small kitchen, I still don’t have a space for my collection of refrigerator magnets! Can you guess where the dishwasher and refrigerator are hiding? Oh, Bee. I was going to say "this is my kind of post," but on this blog, aren't they all? For the record, I dream of having as much counter and cabinet space as you do. I'll keep my regular American-sized fridge, though! Speaking of dreaming, my dreamiest of coveted kitchen tools is a KitchenAid mixer. Red, the professional 6 quart series. Someday. It might actually be for the best that I don't have one at the moment, because I'd be turning out delicious doughy things all the time, the consequences of which would be a) I'd never graduate, and b) I'd be eating delicious doughy things all the time. I'll second your nominations of the wooden spoons/silicone spatulas, and add a good chef's knife and an enameled cast iron Dutch oven. I use my Le Creuset pot 4-5 times per week, sometimes more than once in a given day. I don't even bother putting it away in a cabinet anymore; it lives on the stove (which has the happy side effect of relieving some pressure on the cabinet space situation). Good thing it's so nice to look at! I also have a vintage mixing bowl (clear, green, and I think made by Pyrex decades ago) that is the perfect size for mixing up a batch of muffins. quickbreads, or pancakes. It's what I invariably use for those tasks; and if it's dirty, I'll bypass all of my other mixing bowls and wash this one specially. And I love my set of vintage Pyrex mixing bowls. But it's the wooden spoon (perhaps along with a silicone-head spatula), the chef's knife, the dutch oven, and that green mixing bowl that are the hardest working items in my kitchen. I don't know what I'd do without them. I'll be heartbroken when the green bowl dies--they don't make them anymore, and they're tough to find. Enough of my rambling on cookware. Is the dishwasher just to the right of the oven? Hmmmm.... what am I missing about the Kitchen Aid mixer? I own one, but it is tucked away in the pantry... What I do use every day (at least) once is my red Kitchen Aid food processor (affectionately known as the Ferrari). Today I wasn't cooking much but I used it for smoothies, chopping and for making a pear/rhubarb crumble topping. Tell me what I'm missing with the mixer!!! 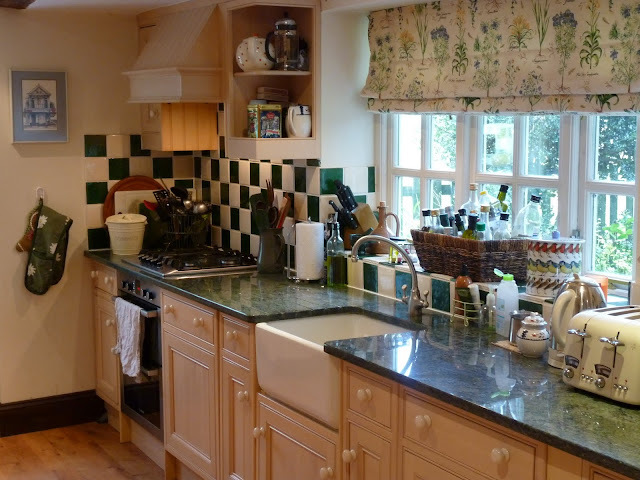 i am so getting an Aga in my next kitchen. Bee, you are my kind of woman. An Aga is THE kitchen equipment if you ask me. Already for more than a decade, even though I moved country, I have a large information folder of all type of Aga's. If I ever grow up and get a house with a large kitchen. An Aga will be mine. After reading your comment about Julochka's kitchen post I gather that you really *don't* have a full size refrigerator! I'm allowing myself some good old American shock and dismay. Anne - Those pyrex bowls are beautiful! Even though I'm attached to some of my kitchen things, in another mood (and if at Sur la Table or Williams-Sonoma)I could happily start afresh with all new stuff. Like you, I have a glass bowl that is my absolute favorite, though. When you do finish your PhD, I definitely think you should reward yourself with a KitchenAid mixer! 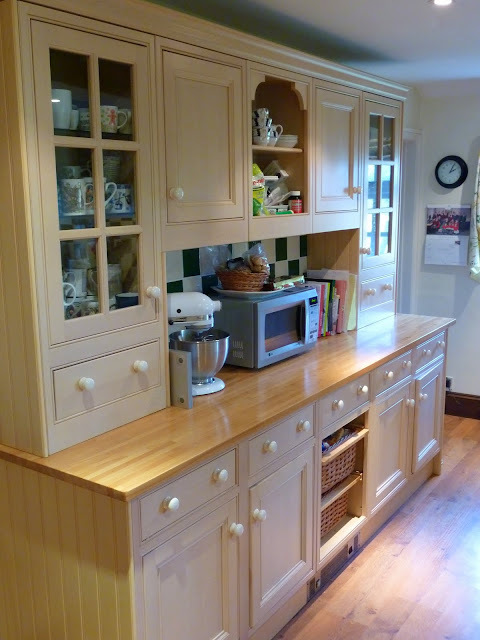 And wouldn't it be heavenly to have PLENTY of counter space? Kristina - You can always tell if someone has a bias towards baking! M - See the above remark. Really, unless you bake a lot, the food processor is probably more useful. Jelica - I know that I shouldn't complain! I realize that smallness is relative . . .
Julochka - You don't have a microplane? You will LOVE it! Nimble - The (tiny) refigerator is to the right of the sink and the dishwasher is to the left (Anne guessed correctly). We also have another tiny half frig/half freezer in our utility room. I dream of a big frig, though. There is nothing like a KitchenAid for creaming and whipping. That's all I'm going to say! Your kitchen is lovely. Ours is probably similarly sized, though we do have a full fridge. But the saving grace is the large pot rack that we have over the sink - it hangs more than a dozen pots and pans - essential for freeing cabinet space for other things. My mother's old Le Creuset casserole is probably my best thing at the moment, but I'd really like to know if a KitchenAid is better than the old Kenwood Chef (that I stopped using as I spent so much time scraping the sides down, to the point where it was quicker to cream butter and sugar with a wooden spoon). Does any one have experience of both and an opinion to share? Rachel - without comparing the two, I still feel it is safe to say that the KitchenAid is much, much better! i am in love with this post! yay for kitchens and kitchen aide mixers! I had to smile at your Aga statement. We looked at a house with one of those monsters and had no clue they were so desirable! The real estate agent told us they were good for cooking and drying out our shoes. LOL!